RoboRealm - Robot Localization !!! I have a big white particle board on which my robots moves. 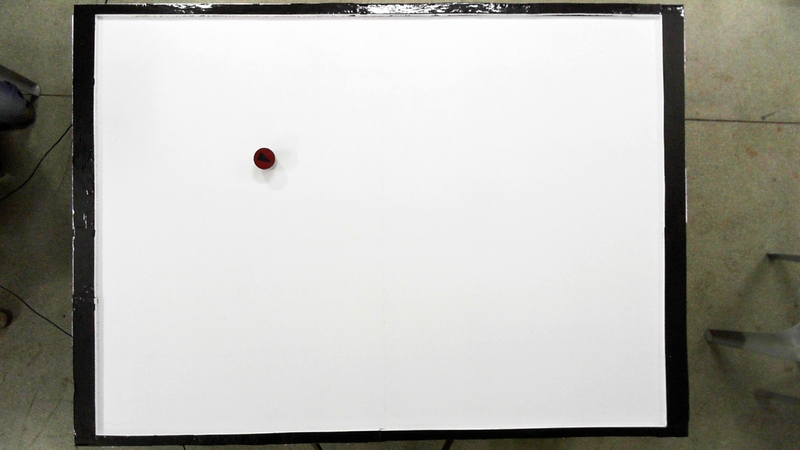 I have mounted a camera on a L shaped structure on the top of this board exactly in the middle so that the camera sees the full board along with the borders. I have cropped the borders, such that, X Start = 168, X End = 1046, Y Start = 53, and Y End = 688. I have attached circular different colour markers on my robots. So what I want is that at any point of a time if I click a particular robot the program should tell me its X and Y coordinates. Attached is one image with a single robot. I'm not sure that you really want what you are asking for ... but see the attached robofile. That will define robot_x, robot_y, robot_xx and robot_yy which outline the bounding box of the robot IF you click on a red robot. What I really think you want is to automatically identify the location of all robots in view rather than clicking on them ... but since that's not what you asked for the attached requires a mouse click in the general vicinity of the robot.